A Memorial Health System (MHS) Volunteer Appreciation Bingo Party was recently held at the Nichols Education Center in Abilene. 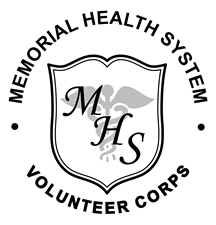 The event was a “Thank You” to MHS Volunteer Corps members and Hospice of Dickinson County volunteers for the tremendous care and support they provide. 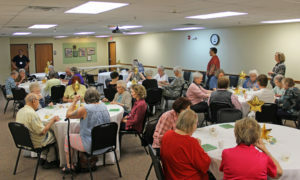 Pictured (at left) is the group of volunteers in attendance playing bingo and ready to win some prizes. 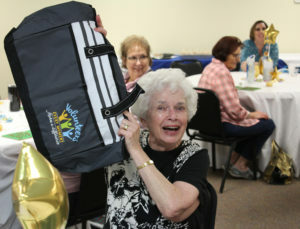 Shown on the right: Sue Murry, MHS Volunteer Corps member, displaying a prize she won. MHS employees who were bingo callers for the event included Matt Schlagel, Russ Vermillion, Teresa Hudson, and Sherrie Root. Anyone with questions about becoming a volunteer may contact MHS Director of Volunteer Services, Michelle McClanahan, at (785) 263-6692 or Hospice of Dickinson County Volunteer Coordinator, Debbie Bielefeld, at (785) 263-6630.